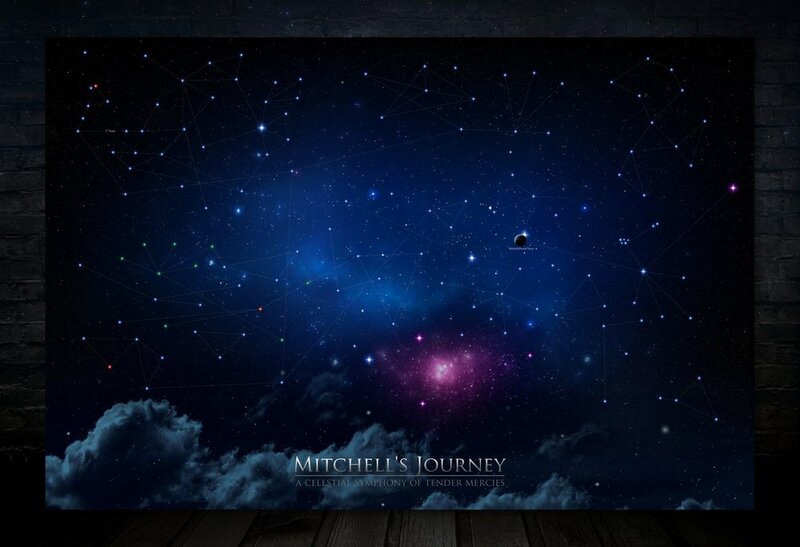 Last October, just after I wrote the essay NIGHTFALL I sat at my computer and began to chart some of the more significant tender mercies we have received along Mitchell’s Journey. As I began to read my journals, meditate, and prayerfully reflect on my life my eyes were opened and I began to see like never before. What’s more, realized Mitchell’s Journey started long before he was even born. In fact, 30 years prior to his birth things were put in motion that would directly prepare me for this hardship. Were you to download this image and zoom in you would more easily see the constellations of tender mercies. The lines between the stars are purposeful and illustrate the interrelationship between them and it is largely chronological, from left to right. The color of the stars is also purposeful and has special meaning. I have removed the labels for each star and will not share the details of these tender mercies because they are sacred and for me alone to know. I can say that each one of these events is absolutely real. It was only upon stepping back, allowing my spiritual eyes to adjust and to see the larger picture that I began to discern the majesty of God and all that He has done for my son and family. I have now printed this chart on a large glossy plot and it now hangs in my home office as a reminder that if God was in the details of my life then, He is surely in the details of my life today. So where to go from here? I don’t know. All I know is the sun will rise tomorrow, my son will still be gone and my heart will still be heavy with grief. I also know, no matter how dark, difficult and lonely this journey may have felt at times, I have never been alone. I used to stand at the edge of an abyss with its mouth yawned, inching to devour my son. I now sit on the shore of a vast ocean peering into its infinite horizon. It is night, clouds lay low and are sparsely scattered and the heavens are clear to see. There is no storm in my heart this day and I can feel a gentle breeze, as if a whisper that all is well. As I look upward I can see these heavenly constellations that tell me I have never been alone. I must cross the waters now – and that is a journey, too. Over the last few weeks I have felt a certain peace come into my life. It is unlike anything I've ever felt. Surely there have been tears and moments of profound sorrow, but there is an ebbing tide of light that is washing over me and filling my soul. I don’t entirely understand it, but I am grateful just the same … for that is another tender mercy, an evidence of God’s love. With each day I am learning to adjust to life without my son. It isn't easy – but it is happening. I also have a lovely wife and 3 remaining children who will continue to receive the same love I have always offered them, and Mitch. That is not lost on me and I find great joy in them every single day. There will be difficult days ahead, no doubt, and I will write of them. But I will also write of our happy times and discoveries we made along Mitchell’s Journey – way back when to now.